[London]: BBC Books, . First edition. A fine copy in a fine dust jacket. (21208). Octavo, jacket art by Dave McKean, boards. 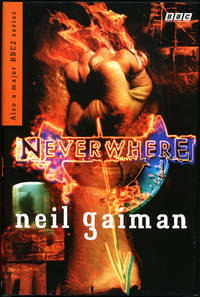 Novelization of the television series written by Gaiman and Lenny Henry. After helping a young woman a young businessman becomes invisible to his world and enters a new reality which exists in subterranean London. The author's first solo novel after writing a number of graphic novels.